College campuses across the nation are filled with talented student athletes, those capable of exceling both in the classroom and on the court, field or ice. Princeton University, a prestigious Ivy League institution, holds this distinction as well. Once the home of the legendary Hobey Baker, the New Jersey-based school currently hosts one of the greatest players of the modern era. 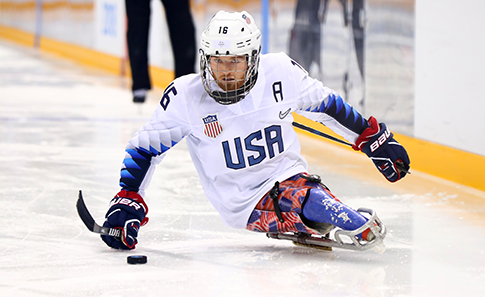 The U.S. National Sled Hockey Team’s all-time leading points scorer, Declan Farmer, roams the school established in 1746. Now back and immersed in classes after a whirlwind winter, one that saw him reach the pinnacle of his sport – again – winning gold at the 2018 Paralympic Winter Games after achieving the same in 2014. Farmer’s shining moment in PyeongChang, South Korea was every hockey player’s dream when he notched the game-tying goal in the gold-medal game against Canada, with only 37.8 seconds left to play, and followed it up with the game winner in overtime. The outcome of the game was a surreal turn around, truly emphasizing Farmer’s stature in the sport after the born-bilateral amputee began playing it as an 8-year-old, seriously competing just two years later. He made his U.S. National Sled Team debut in 2012, at the age of 15. It’s led to accomplishments, accolades – Farmer also has a gold from the Sled World Championships in 2015 – and many memories with the U.S. National Sled Team. While Farmer has an ability to shine in the tensest moments and prop up his team, any mention of his all-time points lead, 162, is quickly deflected toward those who assist in his heroics. In the process of his career, the Tampa, Fla., native and Tampa Bay Lightning Sled hockey member has become a marquee role model for others playing the sport. It’s not a role Farmer takes lightly. Farmer's 18 points in the 2018 Paralympic Games tied him for the U.S. team and tournament lead with teammate Brody Roybal. “It definitely means a lot to me,” Farmer said. “When I first met U.S. National Team players, a lot of them gave me advice. Josh Pauls, who’s on the team now, coached me at development camp when I was 13. Farmer skates four or five times a week, working out on his own. He holds a similar schedule to any other varsity athlete, having to manage his studies in the day and homework while finding time to practice and work out. When the junior economics major slides onto the ice, he’s intently focused on the nuisances of his game to help him perform. It showed when Farmer led the Para Hockey Cup in points, with 12, as the U.S. staked claim to its fifth-consecutive tournament title. 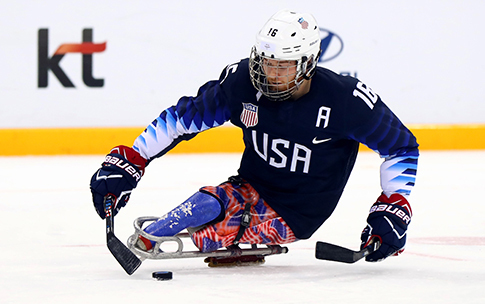 The next chance to represent the U.S. is a two-game series against Canada, March 21-23 in Indian Trail, N.C., while a gold medal will be on the line at the 2019 World Para Ice Hockey Championship, April 27-May 4 in Ostrava, Czech Republic. Until then, Farmer is focused on his studies, eyeing a chance at a third straight Paralympics gold in 2022. Until then, he will continue to enjoy the journey. “It’s really just been a heck of a ride so far,” he said.